Yes I am officially here in the city of Dreaming Spires, Oxford! and I couldn't be more excited! It has been officially five weeks so far but five magical and exciting ones! Oxford is the most beautiful and magical city, and I can't wait to tell you all about it. There isn't one day where I don't find myself staring at a building somewhere or marvelling at the history behind it. I was waiting to get into the term-time rhythm and fully adjust to the Oxford timing before blogging, so no I didn't forget my blog fam! I think I can say I am a full Oxonian now lol and I am fully settled in. So as promised, I will be sharing everything about Oxford and all my experiences from the formal dinners to the beautiful architecture, art galleries, museums, classes and all the Oxford traditions that make Oxford, Oxford. So let's go! One thing I'll say is Oxford is a University like no other, and I guess that's what makes it special! I was watching a movie this summer about Oxford and the main character said "attending Oxford is like being invited to a hundred events all at once, and you can't attend everything" , and this is so true. I remember being so amazed by all the opportunities and events when I first got here. Fun fact about Oxford, a lot of of Harry Potter scenes were shot in Oxford and seeing as that is my favourite book, it's really cool! You are also likely to find tourists at Oxford almost every day that just want to catch a glimpse of the various places where these scenes were shot. So let's start with the city. Oxford is fondly called the 'City of Dreaming Spires' because of all the tall dreaming spires that stand above the city. 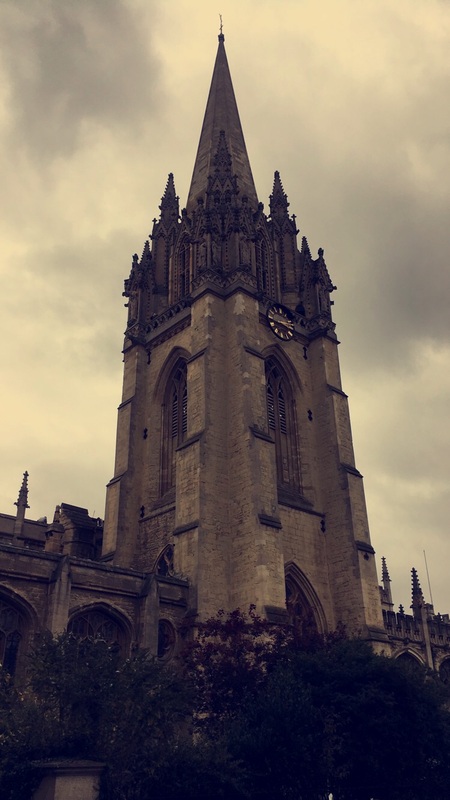 Matthew Arnorld, the Victorian poet was the first person to call Oxford ‘the city of dreaming spires’ after the stunning architecture of the university's buildings. And as you guessed, I spend a lot of my time taking pictures of the buildings. This is the Radcliffe Camera, arguably the most famous building in Oxford! It's also the Snapchat filter for Oxford. So during Matriculation, most people come here to take photographs. This is the Door to Exeter College. I love Beautiful Doors. Oxford is filled with so many but this one has my heart. This is the Bridge of Sighs. It links together the old and new Quadrangles of Hertford college. This is the Dining Hall at Christ Church College, which provided the inspiration for the great hall in the Harry Potter films. The video gives you a better idea of the city. My pictures can't do it justice. Oxford is famously known as a cycling city, so most people move around with bicycles. It's the fastest way to get around, seeing as a lot of the streets are very narrow- and that is what makes the city quaint and unique, it's almost like going back in time. There is so much history every where you look. This here is the Eagle and Child. It is famous for being the pub where C.S Lewis (writer of the Chronicles of Narnia and so many other works) and J.R.R Tolkien (writer of The Lord of the Rings and The Hobbit) would meet with their friends every week to discuss their writing ideas, when they studied at Oxford. They were part of a writing group called 'The Inklings' and they would meet here to read their work to each other, so the 'Eagle and Child' is every writers dream literally. I walk past the Eagle and Child every day on my way to class, and you're always likely to find a tourist or two taking pictures of the Pub, so it's quite historical. 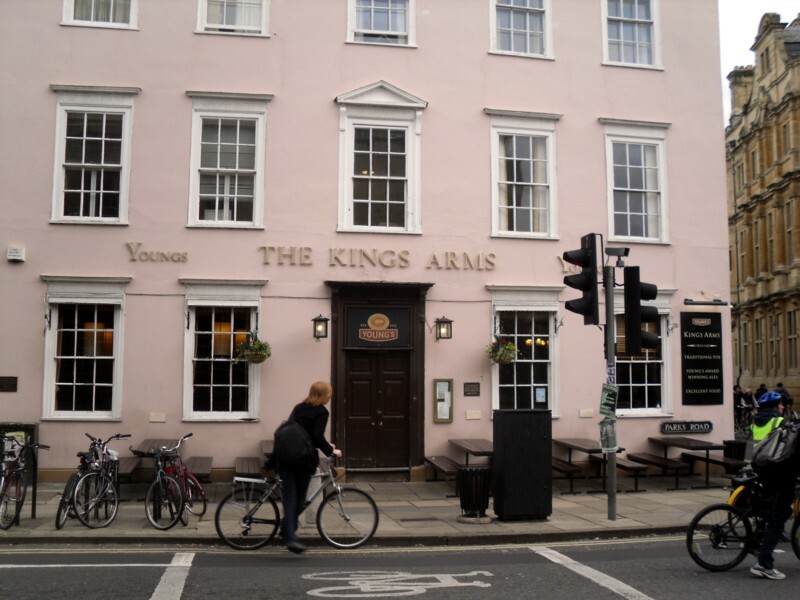 This is the King's Arms, one of the oldest pubs in Oxford, the other day I heard a Tour guide telling some tourists that William Shakespeare used to go to this pub, so again another bit of history! Oxford is known for it's beautiful architecture, and you can see that all through the University's buildings. When I first moved here, I was amazed by the number of tourists that come here everyday. So you're almost always likely to run into tourists with their cameras taking pictures or on a tour of the city. These are some of the University's buildings. This here is the Exam Schools where all examinations are held. This is the University Chapel of St Mary, they also get quite a number of tourists. 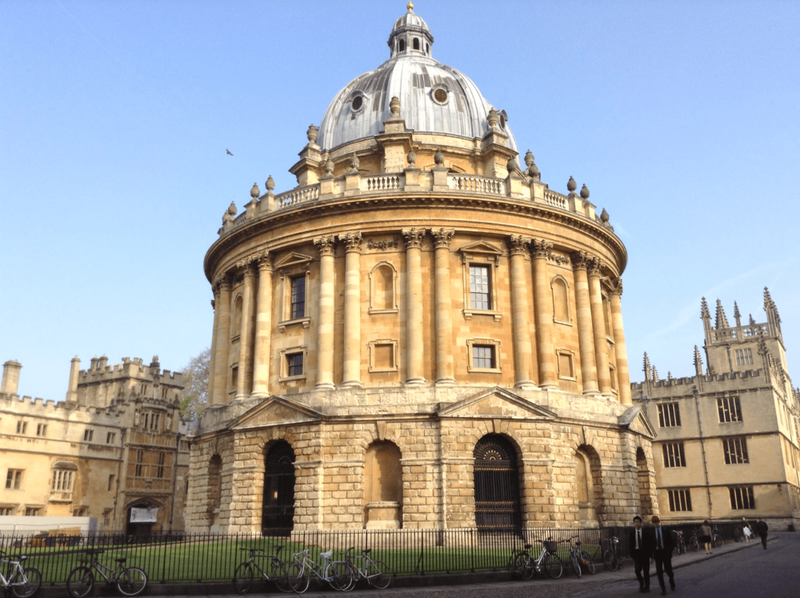 Oxford operates a collegiate system, which means that when you get offered a place at the university, you get accepted into a College. There are 38 colleges at Oxford, all with their unique characters and traditions. The University's colleges are located all around the city of Oxford. The only other university that operates the Collegiate system is Cambridge. Over your time at University, your college becomes kind of like your family- think of Harry Potter, and being accepted into Gryffindor or something lol. Sports games are also held against different colleges, so at some point during the year, you would think your college is the best college lol. Each College has its own grounds, gardens, dining hall, library, common room, bar, dormitory rooms, so it's like a residence really. You can choose a college when applying to Oxford, or allow the University choose a college for you. When I was applying, I didn't actually pick a college (because I just wanted to get into the Uni lol) but I was accepted into St Hugh's College and I couldn't be happier. I actually think my College is the best one now lol ( I am not biased at all! ) St Hugh's is known for teaching some of the world's most influential women- Theresa May and Amal Clooney studied at St Hugh's College- and seeing as I am a huge Amal fan, I feel so lucky to be here. St Hugh’s College was founded in 1886. Each College has a Dining Hall that serves Breakfast, Lunch and Dinner all through the year, at a very subsidized fee. There are also formal dinners held every tuesday where you have to dress formally to. So this was my first formal dinner with my friend Paola. We had the best time! This is the Dining Hall where the formal dinners are held. The formal dinners are really traditional, so at the start, the teachers and College staff walk in, in robes and someone stands in the middle and recites something in Latin while everyone is standing. After the recitation is over, everyone gets seated for their meal. Then there's more latin at the end lol That's something about Oxford- so much Latin everywhere lol. It's really amusing the first time but then you get used to it. At College dinners, you also get to meet very interesting people, so you're advised to go for as many as you can. This is St Hugh's College. As I said earlier, each college has its unique character so St Hugh's College is known for having beautiful gardens. Everytime I tell someone I'm from St Hugh's, that's the first thing they say, "ahh the gardens!" St Hugh's College is also used for Conferences and Events outside of Term time as you can see in the Events Promotional Video here. You can see the Dining hall clearly in the video at the '0.52' mark, and that's where all the formal dinners are held. As you heard at the start of the video, there is a bell that rings loudly every hour in Oxford. A lot of the time it wakes me up in the morning lol, it's kind of like the Big Ben- so it chimes every hour. Only thing is I have no idea where the sound is from lol, I think it's the Carfax Tower, I am not sure.... hmm... that's something to find out lol But the sound reminds me that an hour has gone by which is useful, especially if I'm bumming around lol so thanks Clock wherever you are. That's me in my Matriculation Gear. So the Matriculation events start in the morning. You matriculate with your college. So all the new students at St Hugh's- both undergradudate and graduate meet in the Garden around 10 am in the morning to take the college group photo, and individual ones as well if you want that too. Then you make your way to the College Hall where the Principal of the College addresses you, and officially welcomes you to the college, you also hear from other college staff as well. After that, every one walks in twos to the Sheldonian Theatre in Town where the Matriculation Ceremony is held. It's about a twenty minute walk, and its a lot of people walking. So every one is making their way in a single file from all their various colleges- all 38 of them- all around Oxford to the Sheldonian theatre. Oxford is always filled with tourists so the matriculation ceremony is entertainment for them really. So as you walk, you have tourists taking pictures because they find it exciting. It's like a town spectacle lol so everyone in the town knows that Oxford Students are matriculating today and they watch them make their way to the theatre in their fancy gowns lol. It was really cool. That's me and my friend before the Ceremony. This is the Sheldonian theatre in all of its Glory!- Graduation ceremonies are also held here. This is the entrance to the Sheldonian Theatre. Fun Fact, Malala Yousafzai- Nobel Peace Prize winner, was at Oxford's matriculation ceremony. I didn't get to see her, but apparently she was present seeing as she's studying at Lady Margaret Hall College in Oxford. There are also some videos of the Matriculation Ceremony on my Instagram as well. The ceilings in the Sheldonian were just divine.. The Ceremony lasts for about an hour. It has the same formalities as a Gradauation ceremony. Every one gets seated, colleges tend to sit together. Then the entire university staff walks in, in ceremonial robes while music is playing. It's Oxford so there's some latin at the start, then the Vice Chancellor talks about all the great people that once sat in the same hall and how you're standing all their shoulders. She talks about the legacy that Oxford has for being devoted to the pursuit of knowledge. It's one of those moments where you pinch yourself like this is really happening, like I'm really here, and you look around you and everyone is equally as excited. Then there's some latin again at the end. Then the Vice Chancellor translates the latin for the last time and says "what that (i.e the latin) meant was that you are now officially members of the University of Oxford" then everyone screamsss! Then the staff walks out, then the students follow suit. Matriculation has definitely been a highlight of my time here. It's definitely one memory I don't want to forget. This is a photo after the Ceremony, next to the Sheldonian Theatre. This is in front of the Radcliffe Camera. This is outside the Sheldonian. While Oxford is exciting, it's also very intense as well. This is partly the reason why I am just putting up a blog post. In one of my first classes, I had over a hundred pages of reading to get through before the class, and the teacher started the class by saying "If you notice the reading this week was quite light" lol I remember thinking "so what is heavy". So the Oxford BCL has been called "the most prestigious masters level course in the common law world." Everytime I tell someone at Oxford I'm on the BCL, there's always that "wow" after. This guy I met once said "that's like the holy grail of law". So it's truly world leading. The only rival at the moment is the Harvard LLM, at least I thought so, until one of my tutors told us, "If you wanna have fun go to Harvard, this is Oxford" lol! So we have the first week for orientation, and this is filled with talks and seminars about the BCL course and advice on how to handle it, library sessions etc. In the "welcome talk" the associate dean said to us " ...we had to say no to so many impressive students that applied, so you are the final 150 students." The Idea is to get the brightest students from all over the world- so there are 22 nationalities represented on the course. The thing with the BCL is everyone around you is outstanding, and you get to meet some very interesting people. With all that, also comes a lot of work. The BCL is taught through weekly lectures and seminars. Seminars are interactive sessions where you are given the reading before hand and expected to come to class to discuss what you have read. So it's taught at a significantly higher level than an undergraduate law degree. No one is coming to teach you the material afresh, you are expected to have done the reading then to come and discuss with the professor. So you have to study before each class, and that means hundreds of pages of reading every week! Luckily my College has a library and, there is also the Bodleian Law Library and then there is also the main Bodleian Library. This is the Bodleian Library- it is Oxford's main Library for the whole University. It's also called the "Old Bodleian" because it's very old and it was the first Library at Oxford. This is the Statue in front of the Bodleain Library. This is inside the Bodleian Library. In the Bodleain Library, you also have the Divinity school on the first floor. A lot of Harry Potter scenes were shot here, you might recognise this scene with Professor McGonagall in the Divinity School. I came here with my brother when he visited the other day, students are allowed to take two guests in for free. Other tourists have to pay. I found these set of buildings on my way to the Law Faculty one day, all the buildings on that street are so colourful! and I love colour so Holywell street is definitely my second fave street at the moment. My first is "Turl Street" where 'the missing bean'- my fave coffee shop is. 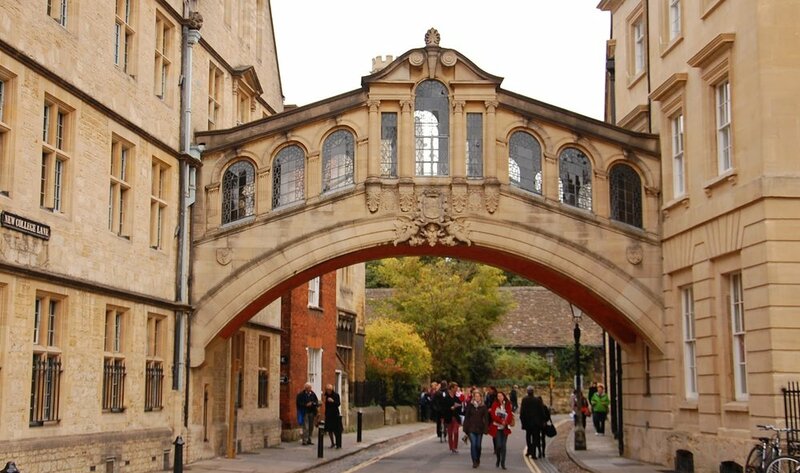 The Masters in Law Course also uses the Tutorial System which Oxford is famous for. With tutorials, you have two to three students with the tutor- who is usually the lecturer taking the course. You are expected to write an essay before each tutorial. During the tutorial, the teacher critiques your work and you have to defend your points. The other two students in the tutorial are also expected to critique your work. Luckily, my tutorial-mates have been nice so far, so the other students have said only nice things about my work so far. In my last tutorial, the teacher actually said to us "you know you're allowed to critique each other's work right? why is everyone being so nice" lol I think I'll like it to stay that way. While the BCL is Intense, it's also exciting at the same time! Before I got to Oxford, I was speaking to someone who had taken the course, and she said, "The BCL is two words, intense and exciting" and I remember thinking, surely that is a paradox lol, how can anything be those two things at once. But now I get it; as intense as it is, it is also exciting because you are being taught by the best of the best, in a room full of very exceptional students from all over the world, and all this is happening at Oxford- which is currently the best University in the world. In my first week, the Associate Dean said to us "you'll never be in the same room with as many over-achieving impressive law nerds" in your entire life again, so cherish this moment" lol! But yeah, the teachers are truly experts in their field. I am still star-struck by the fact that my Jurisprudence course is taught by Tony Honore, John Finnis and John Gardner who are Juris legends literally! So Tony Honore was a close friend of HLA Hart and Hart often said that Tony Honore had a huge impact on his book "The Concept of Law" -which is the book that revolutionized modern legal theory and Jurisprudence as we know it. You can't talk about Jurisprudence and not mention Hart's "The Concept of Law." Tony Honore is 96 years of age, and he still teaches at Oxford. He convenes the module with John Gardner. In my first Jurisprudence Class, the class was so full with students who weren't even on the BCL who just came to catch a glimpse of Tony Honore. I remember being so excited in my first class lol I sat so close lol (and still do lol) I also wrote an essay on a quote by John Gardner in my second year of my law degree, so having him teach me is surreal as well. Next semester, John Finnis will be taking the Jurisprudence module- I mean, what will natural law be without John Finnis, I can't wait for that either! Oxford is generally known for being the home of Jurisprudence, HLA Hart and Dworkin used to teach here, and both of them held the position of "Professor of Jurisprudence" during their respective academic careers. The undergraduate law degree at Oxford is called "Jurisprudence" instead of Law and the LLM is called the "BCL" Yes, Oxford does everything differently! While most of my courses are Corporate Law oriented, I knew I had to take the Jurisprudence course because Oxford is the home of Jurisprudence and there is no better place to take the course than here. Almost all my courses are taught by teachers who wrote the core textbook in that area. Corporate Finance Law is taught by Louise Gullifer and Jenny Payne- who wrote the core textbook for Corporate Finance Law. At Surrey, my family law textbook was by Jonathan Herring who teaches Family law at Oxford, I don't take Family law but I attended a seminar by him once which was nice. Most of my classes are in the Law Faculty. This is the Bodeleain Law Library, also located in the Law Faculty. This gives you an idea of what Graduate study is like at Oxford. Sometimes libraries can get very intense, and that's why we have coffee shops! During my undergraduate degree, we had one major library, but different courses had their books on different floors. So at Surrey, the second floor was the law section because it had all the law books. I found the law section too intense, like I could not study there, so I never studied on the second floor lol. So at Oxford, sometimes I catch up on my readings in Cafes and Coffee shops because I find the atmosphere, a lot less intense. I had a friend send me a list of all the coffee shops in Oxford to try out in my first week, lol I didn't waste time at all. That is another thing Oxford is known for, they have these quaint little cute coffee shops that I can't get enough of. These are a couple of Cafes on my list to try out - Society Cafe, The Missing Bean, Brew, Columbia Coffee, Jericho Coffee Traders and The Grand Cafe. So far, the missing bean has been my fave!! This is me trying to finish my reading at the Missing Bean before my Jurisprudence class. The Grand Cafe is also a cafe I would love to try out, I've passed it several times but I've never had the time to stop and try it out. I'm usually rushing to a class or something. The Grand Cafe was also the first coffee house in England in the year 1650. If you know me, you will know I love Hillsong. It's been my Church since I moved to England. It's funny, Hillsong seems to follow me everywhere lol. So when I was at Surrey, I was at Hillsong Guildford and on the host team too. During my gap year, I was at Hillsong London and on the host team as well. I also was a volunteer at the Hillsong Conference at the 02 arena (twice in 2014 and 2017) Now I'm at Oxford and I get to attend Hillsong Oxford and be on the host team as well. Hillsong Oxford actually reminds me a lot of Hillsong Guildford, it's a lot smaller than Hillsong London, so it feels like home already! There are two things I'm missing out now, that is - The Oxford Union and The Ashmolean Museum, which I will be sharing in my next two posts so look out for that. I recently got the chance to see Marc Jacobs and Edward Enninful- Editor in Chief of British Vogue at the Oxford Union. I also got the chance to watch Emeli Sande perform at the Oxford Union as well, so I would be sharing what that was like. I also had the opportunity of meeting model and activist and new face of Marc Jacobs - Adwoa Aboah as well, and I will be sharing all about that too. I actually did share some pictures from the Oxford Union and the Ashmolean museum (the world's first University museum) on my Instagram and Twitter, so you can check those out. And that's it for now! Make sure to look out for all my Oxford experiences which I will be sharing throughout the year!